Here is my prediction: this Cottage Cheese Pancake will soon be one of the most popular breakfasts of humankind. First, it’s super simple to make. The basic recipe just calls for three ingredients: Cottage cheese, eggs and oats and from start to finish you need a maximum of 12 minutes. Second, eggs are celebrating a huge comeback. After being looked at suspiciously for decades, it has been proven that eggs don’t negatively affect blood cholesterol and don’t cause heart attacks (1). In other words eggs are super nutritious and completely harmless. Fourth, this pancake – because of it’s ingredients – is a 100% natural, no extra powder added, protein powerhouse. Next to gluten-free, high protein products are the rage nowadays. How about 37.5g of protein for breakfast? You’re welcome. 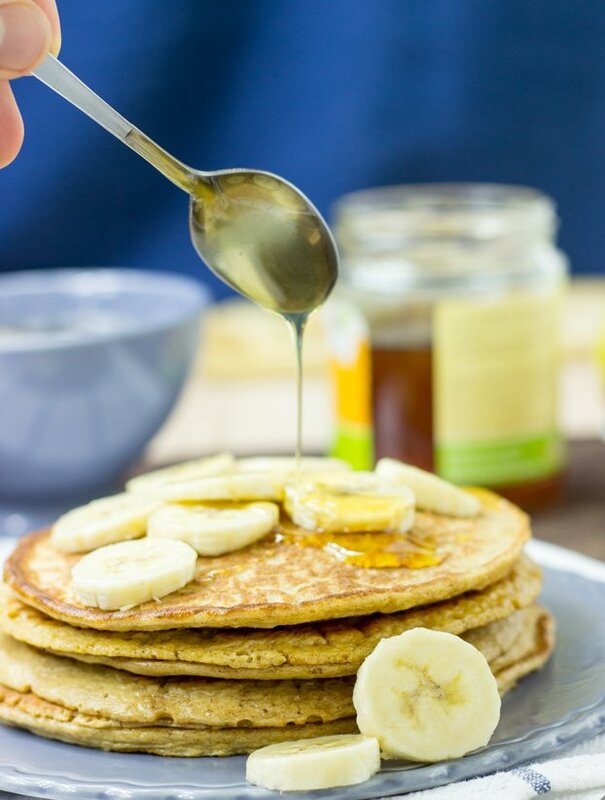 Fifth, all three ingredients help with weight loss because of their satiating effect, making these pancakes an excellent breakfast, even for people on a diet (2, 3, 4). Sixth, they taste bloody good. Period. Eggs are surging through on a comeback, and gluten-free and high protein are taking over the world. To top it all off, convenient, great tasting weight-loss recipes are an evergreen and always will be. See the puzzle falling into place? I do. Since the cottage cheese pancakes are riding high on all these trends, they’re a sure bet to become the world’s most popular breakfast from 2016 on. I even ditched my long time favourite the Banana Egg Pancakes for this one! In case you’re still harbouring any doubts, let’s move to the health section. Cottage cheese belongs to the healthiest cheese groups out there, being low in carbs, low in fats and loaded with proteins. On top of that, cottage cheese is also high in micronutrients like calcium, vitamin B12, vitamin B2 and lots of other nutrients. Dang! Oats are one of the healthiest grains mother nature came up with. They’re high in fiber, proteins and a whole host of other nutrients. 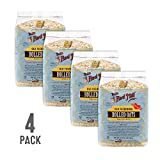 As a further example oats have been linked to lowering the risk of heart disease and diabetes (5, 6, 7). Eggs raise HDL, the “good” cholesterol. HDL stands for High Density Lipoprotein. Higher levels of HDL can lower risk of heart disease, stroke and various health problems (8, 9). Not too bad for a breakfast pancake, right? Do you think these pancakes have the potential to be more successful than breakfast cereal? In general, what was the last dish you’ve been extremely excited about? 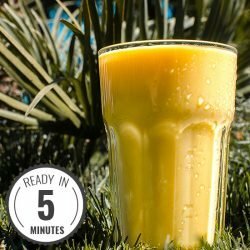 Could you imagine having a smoothie with raw eggs for breakfast? Edit: Since we released this recipe, they have become my absolute, no doubt favourite breakfast of all time. I seriously love them – Howie was right all along. Dave. 37.5g of natural protein. Just three ingredients: Cottage cheese, eggs and oats. 12 minutes from start to finish. You won't be disappointed! Get a bowl or, even better, use a blender. You'll need a non-stick pan for successful pancake action, but that's it. See what you think about this pan. I recently started using coconut oil instead of butter for frying. It works great, especially for pancakes! If you want, give this one a shot. 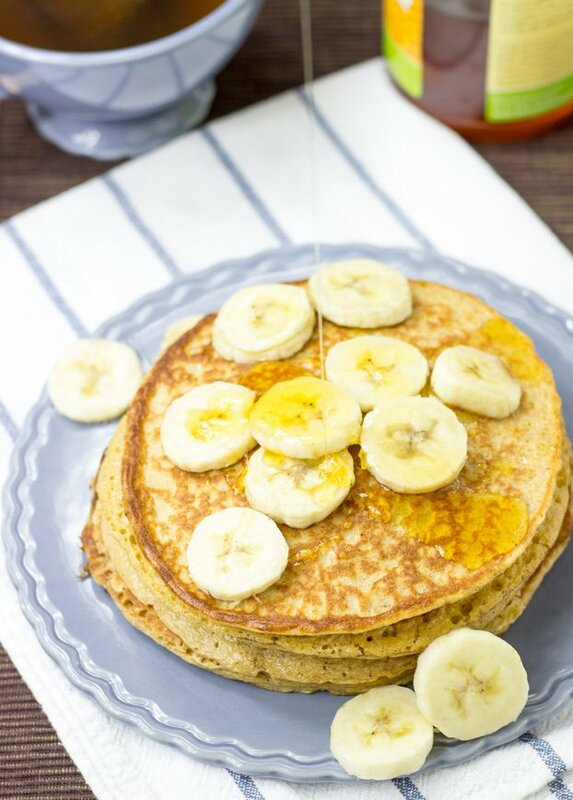 IF YOU LIKED THIS RECIPE: Then you definitely have to check out our Banana Egg Pancakes! Probably even easier to prepare and absolutely delicious. 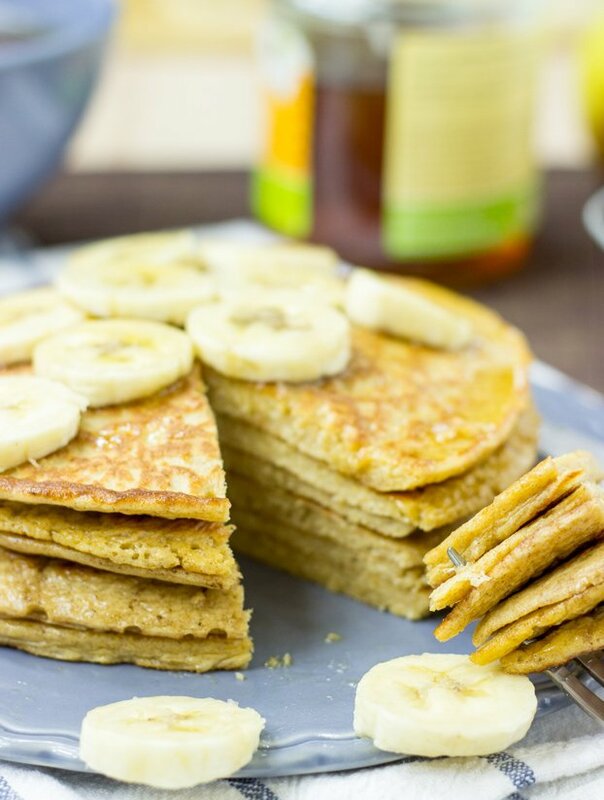 Or if you'd rather like to go into no milk, no egg direction, check out our roundup of these 24 awesome vegan pancakes! Ever wondered what it’s like to go veggie? Try our 30 Day Vegetarian Challenge – open now! Do you have it in you? we love those here as well. Loved these as waffles until I discovered too much dairy makes my feet swell. I replaced the cottage cheese with drained and rinsed canned great northern beans and it worked! Thanks so much for sharing, Kathlene! never thought to add cottage cheese to pancakes – i like the way you think! 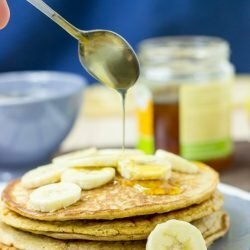 been making the 2 ingredient pancakes using banana and rggs before I found this blog and this recipe was revealed today.it was my favourite breakfast; now I’m curious to try this.cottage cheese? that’s new to me. Give it a try, a little less sweet, but definitely also extremely tasty! I made them this morning and they were yummy. I plan on making them tomorrow morning as well. I really like this one. Something for me – healthy and with proteins. I have to try it! wow, fruit sushi role sounds super interesting! I’ll have to google that! At first I wasn’t much of an egg person either, but that changed quite a bit. But I do enjoy some oatmeal every now and then in the morning. I am blown away – wow – these are fantastic – with only 3 ingredients too! Delicious! WOW!! These look amazing!! Seriously! YUM! …healthy, quick, delicious!! Triple WIN!! 🙂 Great recipe! Thanks for sharing!! Maple syrup and strawberries. Yum, yum. Hauke, sabes donde encuentro queso cottage en Barcelona? O si puedo sustituir por algún otro queso ligero y light que se encuentre por aqui?? Y otra cosa, estas panquecas saben más a dulce o son neutras? Que me gusta comerlas como algo salado, con un poquito de mantequilla, jejeje. Hmm, no estoy seguro la verdad. En el mercadona hay un queso fresco bastante ligero que es mas o menos igual pero no me acuerdo como se llama. Te todas maneras no es como cottage cheese. Aun asi tambien puedes utilisar algo como philadelphia. Sip, son neutras, asi que funcionan perfectamente con algo salado. Besos y abrazos a Barcelona!! These look great, Howie! I love using oats to make pancakes, so I will definitely have to try making these. The photos look so good too – mmm! I just checked up lemon curd. Looks like a really good match! That looks like a yummy breakfast. Will definitely try this for my fussy picky eating toddler. Read through few other recipes in your blog. Seems like I will be a regular visitor hereafter. 🙂 Loved the photographs too. I’ll definitely come around to your blog too. Have a great one! Can’t believe these are just 3 ingredients! They look totally legit! Am I correct in assuming that the oatmeal is cooked? You’re so inventive! I love pancakes! Gorgeous photos. And I love oats in pancakes!! Yum! These are some seriously beautiful photos!! They look so good, I Must try your recipe! These look delicious and so easy to make! I love whole, simple ingredients and a short list of them too. 🙂 Thanks for sharing! F*** me! These pancakes look amazing!!! STUNNING!!!! FIVE STARS! If I have old fashioned oats, should I cook those first or just blend them in? Hey Bink, thanks for your question! Great, thank you! Can’t wait to try them! I just wanted to take a moment and thank you for your blog. I am a recovering from severe anorexia nervosa, and there are a few key recipes on here (this one being the most used) that have helped able to safety put on weight (I am ALMOST weight restored) and feel good about it. I have looked through a lot of your information and learned quite a bit about macros and the breakdowns of nutrients. The way you explain and show the information has been vital in my recovery. You have helped (albeit unknowingly 🙂 ) to regain my life and learn to LOVE food, enjoy cooking, and nourish my body. Your blog has helped to save my life, and help me get my booty back! Have a great one and all the best on your food journey, Anastasia!! this may already be answered, but do you really mean oatmeal, as in cooked and ready to eat? i buy bulk steel-cut oats from the health food store and wonder if i should use them as is. thanks! Sorry still confused. I understand you use the rolled oats, but do you cook them first? Or just blend them out of the box (as dry flakes)? Eager to try this, but want to do it right. Thanks! Yep, right out of the box as dry flakes. No cooking necessary. I’ll update the instructions later on to make that clearer. Thanks for asking! I made these twice this week, and they are by far my new favorite breakfast! Super high in protein and so filling. My recipe however calls for only egg whites (4). I’m going to try yours with whole eggs. I put the oatmeal in the blender for a couple of whirls, then add the other ingredients. A teeny splash of vanilla is great too. Also..I make one HUGE pancake, lol. It’s thin, but puffs up after it’s flipped over. Love it! I tweaked the recipe after a lot of experimentation and wanted to share it! The applesauce makes the pancakes have a slightly sweeter aftertaste and the baking soda makes them rise and be fluffier pancakes. DUDE! These are KILLER! I’m doing the 21 Day Fix and I was lacking protein, carb, and fruit serving. I didn’t feel like eating plain cold cottage cheese with fruit, so I got on Pintetest and looked for alternatives. These hit the spot! I added Mexican vanilla (because who doesn’t love that stuff!) and topped it with pecans, a dusting of cinnamon sugar, and I ate it with grapes on the side. Unfortunately it was the only fruit I had on hand, but some berries would be delightful. I actually ended up eating them as a crepe because mine turned out so thin, but I ain’t complaining. BTW, my fiance hates cottage cheese and he LOVED them. We had a 30 second dance party in the kitchen to celebrate the complete transformation of cottage cheese. Thanks a billion! Hahaaaa!!! What a great story, thanks for the props!! Mexican Vanilla you say? I’ll have to look that up on Amazon – never heard of it. Yeeh, cottage cheese is celebrating a huge comeback in my diet as well! What is the container count? Have you tried freezing them or throwing them in the fridge for later? I am wondering how they would reheat if i sent them to worth with my hubby and he either microwaved or toasted them. So, I made these twice today. For breakfast, as pancakes with blueberries, cinnamon, flax added in, topped with banana. They were pretty good and extremely filing. I will omit the flax next time, as it gave a strange texture. For dinner, we made them into waffles,with only the addition of cinnamon. To make them light and fluffy, we sprayed the eggs and whipped the whites on their own, then folded them in to the mixture of yolks, oatmeal, cottage cheese, and cinnamon. Let me tell you, they were amazing! The texture was so perfect. And I am stuffed! Thanks for the feedback Elizabeth! ❤️❤️♥️ This recipe, it is so simple and pancakes are wonderful. I added cinnamon and can’t wait to add other ingredients. I love that no flour or sugar is in the recipe. I’m following a gestational diabetes diet and am always looking for ways to make my meals more exciting. I can’t do these for breakfast because I have to keep my carb count fairly low early in the day to avoid massive glucose spikes (and oats at breakfast always do me in!). To make this an appropriate meal for one for me, I cut the measurements by 1/3–1/3 cup cottage cheese, 1/3 cup oats and 2 eggs. I use coconut oil to fry them up, then warm up some berries to put on top. I toss some of the warm berries in what’s left in my tub of cottage cheese and the rest go on the pancakes. I use my immersion blender to mix it up and like the consistency. I’ve made Greek yogurt pancakes in the past and they’re often really hard to flip. I still kept these relatively small, maybe 1/4 cup of batter per pancake and got eight easy-flipping pancakes out of it. This is a a total win in terms of taste and fitting in with my meal plan. I’m one happy mama! That sounds really good Tina! Thanks for sharing, we hope it will help other people out there. I’m not sure how it would fit to your diet, we also have a recipe that uses just bananas and eggs to make pancakes, would that interest you? Absolutely! That could be a good snack as well. This is definitely the biggest thing in 2016!! Deserves a five star award. Added a banana for a bit of sweetness and it worked fine. Made 3 batches and it turned out great every single time…pretty easy to flip as well. Thank you for this incredibly easy and healthy recipe. Great to hear you like these pancakes. Dave is a huge fan as well. We could open up a cottage cheese pancake fan club?! Great recipe! Do you think that I could replace the cottage cheese with plain Greek yoghurt? Fabulous pancakes! I added a bit of pumpkin pie spice and vanilla to the three basic ingredients. My husband, 18 yr old brother, and 13 yr old daughter ate them up without knowing they weren’t traditional pancakes. All sang praises before I told them they were actually healthy! Honestly, they don’t have the fluffy rise of traditional pancakes, but the results are still great and I will be using this recipe from now on! Looking forward to tweaking with variations, like adding banana or blueberries to the batter. Thank you!!! Yesss, try adding banana! That makes them even more fun to eat, I’m sure (I’m a classic banana egg pancake fan – it’s another recipe on our blog). But yes, I think the batter is a great base to try out many additional ingredients! I must be doing something wrong as this just went straight into the bin. Mixture just fell apart in the pan and made a gigantic mess. Like the idea of the ingredients but it doesnt cook well. Hi Bianca! That’s a shame – there’s gotta be a fix though. Did you use a non stick pan? It really makes a difference. It also helps to make sure you have enough oil on the cooking area of the pan, it means they cook a lot smoother all over and shouldn’t break apart. My last idea would be to cook just small pancakes to begin with, as they’re much easier to flip and control. I hope that helps – let us know how you get on! Absolutely stellar! Thank you!! I made these as a special treat for Mother’s Day b’fast, and was amazed at how light and fluffy they were! * topped with raspberry purée – just a touch! Next time, I’m adding sliced bananas and a touch of lemon or blueberry topping! I’m eating one (leftovers rock) for lunch right now topped with a smidge of Justins Maple Almond Butter! Side note: If you are ever in Bozeman, MT, be sure to try the cottage cheese pancakes at Nova Café! Quite excited about that tbh. Hi Howie: calorie count about 350? Vegetarian? What kind of plant does cottage cheese come from? I’m interested in recommending these to my patients who have diabetes. Can you please tell me how many total pancakes this recipe makes and what size they are? the nutrition facts are great, but you don’t list a serving size. So, I have no idea how many pancakes you’re talking about. Is it the entire recipe or just a couple of pancakes? Thank you! Hi Sue! I’m really glad to hear that. Sorry for not being clear on those two things: The batter makes 1 huge pancake or 2 mid sized pancakes. The nutrition facts equal the whole batter, so 3 eggs, half a cup of rolled oats and half a cup of cottage cheese. Thanks a lot for pointing this out, I also updated the recipe. Best regards! Thanks Howie! I’m looking forward to making these and I’ll experiment with the pancake size. If I get 4 normal sized pancakes (4″ each) out of one batch, then I will just divide your nutrition facts by 4 to figure out how much is one pancake. This recipe sounds awesome! I kept trying to click on 5 stars but the site would not allow me to click past 4. It might be a glitch. But this recipe is definitely 5 star deserving!! You are God-sent. What’s more both of you are so humble replying to every query. Thank you. Tried it today as lunch and was amazing and so filling. I didn’t quite get the pancake right but the suggestions of others has been helpful. Great work guys! Thank you Abbie! That’s really, really nice to hear. Hope the pancake comes out perfect next time too! This recipe deserves ten stars!!! I made the first dozen tiny, thinking that larger would be impossible to flip…then I experimented and made a few as big as the skillet, and they were GORGEOUS! Gives me the idea to make the batter a little thinner and make all-purpose tortilla-style wraps. Haa, so cool you like the pancakes, Jeanette! I used a regular skillet, not nonstick, and it worked perfectly! Just got to slightly grease it up! About to have it with banana and maple syrup! Hope the pancake turned out well! We had to come back on here and thank you for this recipe! This is a staple in our house after a celiac diagnosis. 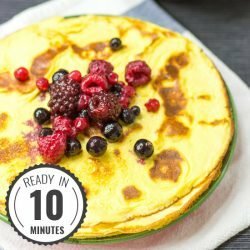 We had tried so many disappointing gf pancakes recipes – this one is delicious and the kids love it. When I calculate the calories, I get 320. I use 2% lowfat cottage cheese. Could that be the difference? I’m looking forward to trying this recipe. Sounds delicious and nutritious! Thank you! Has anyone tried these in the waffle iron? I plan on trying them both ways, just curious. Thank you. BTW, Howie, your comment “Grease is where it’s at” had me hysterical. I like your way of thinking. I feel the giggles coming on again. Funny stuff. Hi Dee! I’d like to try these out in the waffle iron, but I don’t have one unfortunately. Maybe Dave can help you out, I’ll ask him. Haha, yeees we do like a bit of humour on our blog! I tried making these pancakes. First, I sprayed down avocado oil on the pan then poured some of the pancake mixture in and it completely stuck to the pan. I couldn’t flip it. The second time I put a lot of coconut oil down before cooking the pancake and the same thing happened- it completely stuck to the pan. Can you let me know what I’m doing wrong? I would like to try them again. Thank you. These pancakes are amazing! I put the mixture in my belgian waffle maker and made one huge waffle. Topped it with some strawberries and YUMM.. and super easy too! Fantastic recipe for me because the protein and oats really fill me up. It should be noted that using a blender/ food processor makes a much more pancake like result than whisking because it breaks up the big chunks in the cottage cheese. I also reccomend a bit of baking powder for fluffyness. Hi! Thank you so much for this recipe. It didn’t occur to me that you could get such yummy pancakes out of just three ingredients and I love how satisfying they are—they actually keep me going until lunch. Have been making them with my immersion blender: 2 eggs plus a 1/3 cup each of oats and cottage cheese seems to be just the right amount for me. Last couple times I’ve added about 1/2 tsp baking powder to get them into fluffier pancake territory, and vanilla and/or lemon zest is so nice too. Very flexible and nutritious/delicious recipe. Thanks again! Glad you liked the recipe Elle! Yees, it takes a bit of testing and such, but we’re always excited when we get a tasty result with very few ingredients. Baking powder is a great add, I’m sure! Thanks for the recipe. I turned it into a Kaiserschmarrn by accident but it was delicious. Since you seem to have knowledge about foods one can get in germany, what is your thought on the taste difference if i use quark instead of cottage cheese. I am not a fan of the texture of c.c. My wife and I loved he pancakes. Later this summer we’ll be having 17 kids & grandkids at our cottage for a couple of weeks. If the recipe is quadroupleddo the ingredient ratios stay the same? Like 2 cups each cottage cheese and rolled oats, and one dozen eggs? Hi Bruce, glad you enjoyed the pancakes so much, that’s great to hear. Haha wow, that’s a busy cottage (now I see why you’ll need so much cottage cheese :D). Yes, the ratio stays the same, and in fact, if you look next to ‘servings’ in the ingredients section, you’ll see a little slider that you can adjust, and it’ll tell you exactly how much of what you need. Hope that helps, good luck with the cooking! Allergic to oats, could quinoa flakes be used instead of the oats? Hi Jill, to be honest I had never heard of quinoa flakes until I saw your comment! A quick google tells me they can be used pretty interchangably with regular oats, so I don’t see why not. That actually sounds pretty cool. I’m now going to try and hunt down some quinoa flakes in Hamburg. Thanks for the question! Amen about the non-stick pan! I had a mess on my hands, though what I salvaged was yummy. Topped with a microwaved diced peach puree for a sauce. This recipe is the BOMB! Followed the suggestion to use 2 eggs and then added 1/3 cup more oats because it looked too runny. I added a dash of cinnamon and 1 teaspoon vanilla, also. It was so delicious and filling! I had fresh peaches sliced on top and still could only eat half. I reheated that wrapped in foil in my toaster oven and enjoyed it this morning! Yummy goodness, yummy wholesomeness! Thank You! Glad you loved it Rhonda!! That’s awesome to hear. The recipe additions sound great, I particularly like the peach idea. Will give it a go, thanks! Oops! Need to edit my previous comment: 1 egg, 1/2 C cottage cheese, 1/2 C oats, 1 tsp vanilla, dash of cinnamon are my ‘adjusted’ measurements for this BOMB of a recipe. Toppings have included sliced peaches, sliced banana, or other fresh fruit on top of spoonful of unflavored yogurt. Delicious and so filling. I get tired of eggs every morning, and I love that these provide even MORE protein while allowing for some variety. I linked to this recipe from my recent blog post (giving you full credit, of course). I hope you don’t mind! Do you think I could blend up a batch and store in fridge to use over the week? 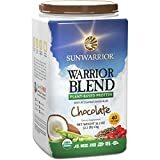 Looking to switch up morning routine from baked oatmeal and hard boiled eggs but want to keep it simple and protein packed to keep all of us going strong until lunch. My solution was to make a double batch and cook smaller-sized pancakes to use during the week. I store them in the fridge with parchment or waxed paper between them, as they sometimes stick together. They are easy to reheat (microwave, toaster oven, etc.) in minutes. I find them to be delicious served cold, too. Just made these and absolutely love them! Came out better than I hoped for after trying various other recipes for flour-less pancakes. Definitely a keeper. Thank you so much. This recipe looks like a winner. I take care of my 81 yr old mother along with my 11 yr old son and I’m always looking for new ways to add protein to our diets. My mom loves all three ingredients though my son only likes eggs but he loves pancakes. We’re going to have this for breakfast tomorrow. Thanks for the idea it looks great. Your recipe sounds yumm! Will definitely give it a try. However, I was wondering if we can substitute eggs with something else? Thank you. I am not a good cook so I will just stick to this recipe for now :). However, if you do try without eggs please do let me know. I tried and it turned out great. Thank you. Can these be made without the oats? Can they be made with egg whites only instead of the whole eggs? Hi! The oats definitely help to give it that extra ‘pancake’ texture – but you could try this one: https://hurrythefoodup.com/worlds-simplest-pancake-recipe/ if you want to skip the oats :). You could also experiment without the yolk in that one! OMG! Thank you soooooo much for the cottage-cheese-pancake recipe. I haven’t had pancakes in years (since being diagnosed as a Type II diabetic). Made this in the food processor, used coconut oil in the skillet. Gotta say they actually turned out better than any of my pre-diabetic attempts at pancakes! Awesome, Sheryl! Sorry to hear about the diabetes, but I’m really glad to hear you can enjoy pancakes again!!! I love the simplicity of your 2-3 ingredient pancakes! And the fact that they all taste great! When I made these Cottage Cheese pancakes, I blended up the dry oats till they were more of a flour texture, then added other ingredients and blended it together. With only using the 3 ingredients, I found them dry, so I fixed that with a bit of Fruit Honey spread. I am excited to try adding in different things to the recipe and see how they turn out! Yes! Experimenting with toppings is half the fun. I’ve just cooked some too – with coconut oil for cooking, and chia seeds in the batter. Yummy! I found your Web site recently as I was looking for recipe and meal prep ideas, and coincidentally enough was planning my own 30-Day Veggie Challenge starting October 1st (which I’m instead starting tomorrow thanks to your inspiration!). Many, many moons ago I was veggie and then vegan for quite some time (and while living in Europe last year cut out a lot of meat products to keep my grocery bills low) — very excited to get into easting that is better for me AND the planet, thanks for the recipes and information! I now live in southern California; it is very hot here, and your delicious recipes don’t require me to spend ages in front of the stove and oven. Hey Thomas! Great that you found us, and it sounds like you’ve got your plan sorted . Good luck, enjoy, and let us know if we can help! Do you think I could use almond flour instead of oats- I can’t have oats or flour (except almond and coconut)? Hi Julie, I don’t see why not at all! I’d probably cut down on the amount a bit – maybe half to start with. Then add a little more as you go and make sure it’s not too watery. Enjoy! My friend Mary R. told me about these today. I cooked them immediately when I got home. THEY ARE AMAZING. The key is definitely to “blend until smooth”. I would love to post a picture! I am not a chef at all and this was my first time making homemade pancakes. DELICIOUS, easy and fun too. My daughter also loved them- a toddler! No more store bought crapola for us. Thank you for sharing recipe! Recently found this on Pinterest and I’m in love. So delicious and filling. I added frozen blueberries for my daughters (2.5 years and 14 months) and they ate them up too. Neither will eat eggs on their own, so I love finding a healthy way to start them out with good protein. Hi Lori, ahh that’s great! I’m glad you’ve found us. Yes, my little ones are the same – they’ll snaffle up any pancakes and it’s great to know they’re made of eggs and cottage cheese – as you say, the protein content from them is incredible!